Poland. She is a doctor of theoretical astrophysics and also conducts studies in biology and the growth of trees. Sensei is a fan of distant travel and adventures. 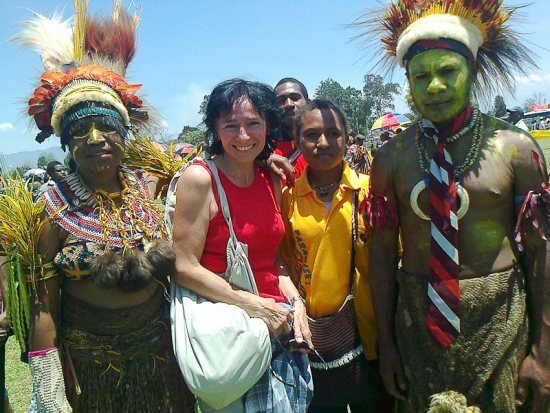 Papua New Guinea is a land of a paradise birds and university studies but not exclusively. She also teaches Oyama karate with self defense for a group of 26 people! One group consists of nuns and missionaries. Second group was created by woman working at the university and their children. Everybody need those lessons because of the frequent attacks and robberies. Especially woman are exposed to the acts of violence and aggression. Students of Sensei Karczewska are practicing in their private quarters and university halls. We send our kind regards and we wish a good stay among Papuans.